This excellently crafted Barn Owl is made by Aurora and is a member of the Signature Collection. Designed with careful attention to detail and crafted from the finest plush materials in the world, Aurora's Signature Collection captures the spirit, grace and vitality of real wildlife. 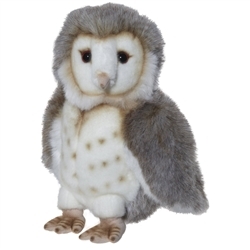 The plush owl has realistically-colored material and makes a great gift or addition to any collection.